Thomas Ruff’s long-term interest in astronomy is evident in many of his works throughout his career. His most recent series, ma.r.s. (2010–ongoing), continues his fascination with space exploration. 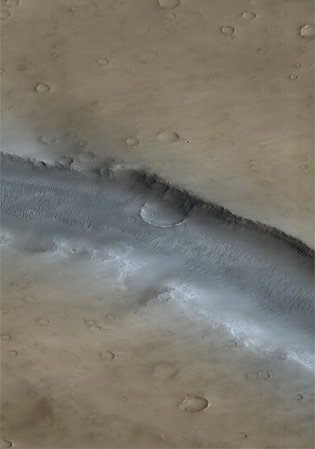 This series is produced from images sent back from the Mars Reconnaissance Orbiter. Ruff has reconfigured these images by adding colour and changing the perspective to suggest that the camera is hovering over the planet. This gives the impression that the planet is in a constant state of flux, while the surface appears to be liquid. Maybe Ruff has found life on Mars. Born in 1958 in Zell am Harmersbach, Germany, Thomas Ruff lives and works in Düsseldorf. He is the recipient of the PHotoEspaña 2011 Award and the ICP Infinity Award in 2006. Major museums worldwide have presented his works, including the Museum of Contemporary Art Chicago (2011), Kunsthalle Wien in Vienna (2009), and the Moderna Museet in Stockholm (2007). His retrospective exhibition Thomas Ruff: Photographs 1979 to Present travelled to nine museums between 2001 and 2004. His works are in the collections of the Art Institute of Chicago, the Dallas Museum of Art, the Hamburger Bahnhof-Museum, the Hirshhorn Museum and Sculpture Garden in Washington, D.C., as well as the Metropolitan Museum of Art and the Guggenheim Museum in New York. Ruff is represented by David Zwirner in New York, the Gagosian Gallery in London, Johnen Galerie in Berlin, and Galerie Wilma Tolksdorf in Frankfurt.